We hear you’re planning a party! Once you’ve settled on the date and guest list, one of the most important factors of event planning is the venue. Whether you’re planning an extravagant party for a milestone birthday or anniversary, or a laid-back and intimate gathering with friends and family, there is something for your event on this list. 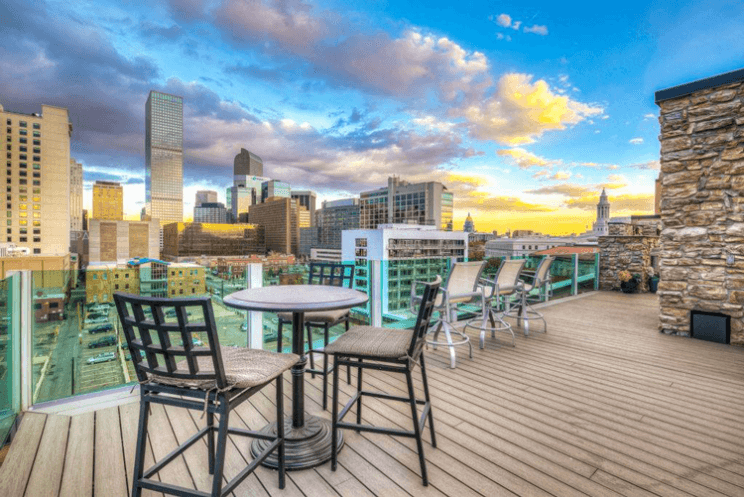 These event venues in Denver range from quirky grandma-themed breweries to sleek rooftop patios, and everything in between. You may have already been to the exciting Alamo Drafthouse Cinema — at either the Littleton location or the relatively new location near Sloan’s Lake in the West Colfax neighborhood. With in-theater dining, state-of-the-art technology, comfortable seating, and an interior bar and lounge space, is there any better place to host a party? Alamo offers a variety of packages for events of all kinds, whether you’re looking to plan a corporate party, a holiday party, a kids’ bash, a wedding, or any other special event. 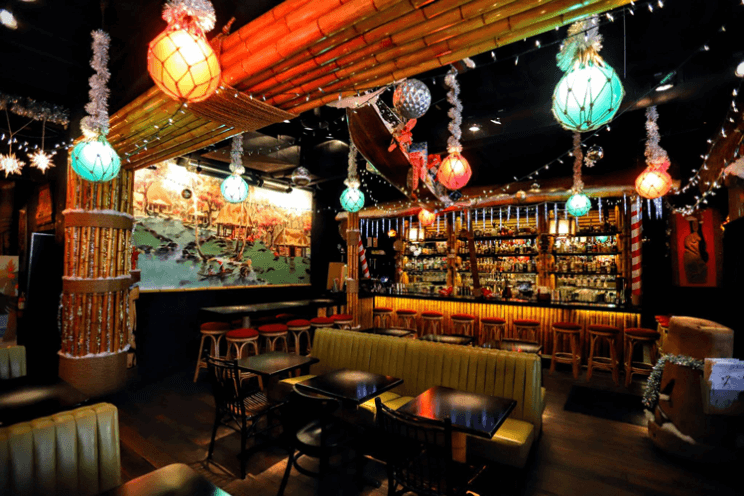 In late 2016, Adrift Tiki Bar was reopened under new ownership — the same real estate group that owns Little Man Ice Cream. The new and improved concept is focused on celebrating Polynesian culture with authenticity and respect. You’ll find a drink menu highlighting tiki classics and plates bursting with Polynesian and Hawaiian flavors. And best of all, Adrift is available for private parties! Contact their team to get more information about group rates. At Punch Bowl Social, there’s no need to worry about adding entertainment to your party. With a bowling alley, dart boards, arcade games, shuffleboard, and karaoke — there is no shortage of things to do at Punch Bowl Social. Plan a private event at Punch Bowl Social, choosing from a variety of venues within the 27,000-square-foot building, including the full venue for a large event, the holiday lodge, the bowling alley, the mezzanine, or the dart room. 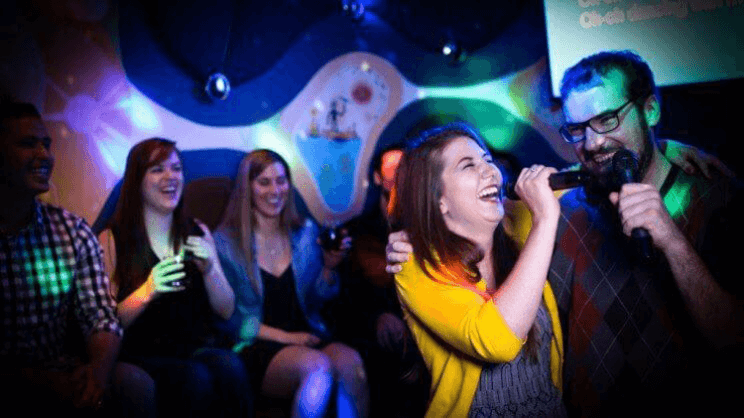 Host your party at this lively karaoke bar in the RiNo neighborhood for a night of fun, music and lots of laughs. Simply book a private suite at Voicebox for your group — and they’ll take care of the rest. Guests choose their song at vbsongs.com, selecting from a vast catalog of tracks. Each room is assigned a personal server, who will take food and drink orders, with both alcoholic and non-alcoholic options. Book your room for a fun experience, whether it’s a birthday, team outing, bachelor or bachelorette party, or a holiday party! If you’ve been to Topgolf in Centennial (or any of its many locations across the country), you know this makes for a lively and entertaining environment — perfect for hosting a party. In addition to the 100+ climate-controlled hitting bays, full-service restaurants and bars, rooftop terrace with a firepit, game hall with arcade games, and 200 HDTVs, Topgolf has private event spaces and meeting rooms. For a smaller group, you can just rent a bay or two for a more cost-effective yet fun-filled evening! No matter where you are in the space, Beatrice & Woodsley is a downright dreamy eatery. Hidden beneath the main dining room, the beautiful wine cellar is ideal for private occasions. The award-winning artistry of the restaurant is translated to a cozy and intimate space complete with an eclectic wine library. This gorgeous room can accommodate up to 28 people, but the entire restaurant is available for private dining as well. Fill out a private event request form to start planning your dream event at Beatrice & Woodsley. This airy and modern Italian eatery in Jefferson Park is worth a visit, whether or not you’re throwing a party. With seasonally based ingredients comprised into delicious Italian dishes presented in many courses, Sartos offers an elevated experience for guests. You can rent out their Verona room for private parties of 22 for a seated dinner or up to 30 for a cocktail setup. Three-course menu options start at just $35 per person. If you have a larger party, you can rent out the entire restaurant for up to 70 people! 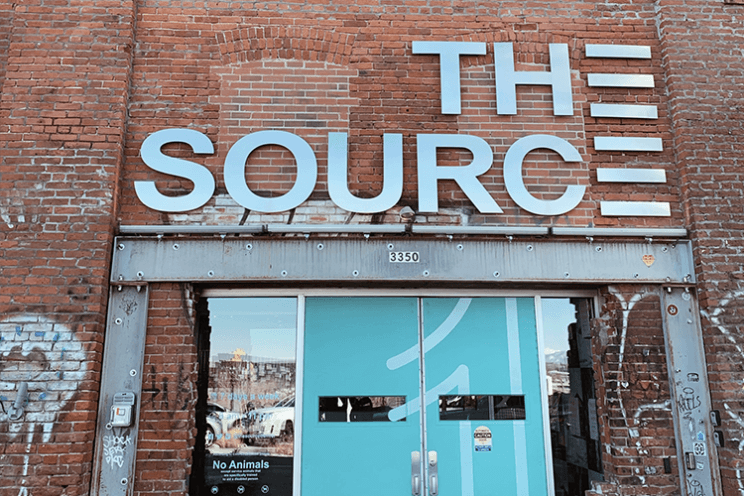 The Source truly has it all — including independent retail shops, award-winning restaurants, and 100 design-forward hotel rooms. 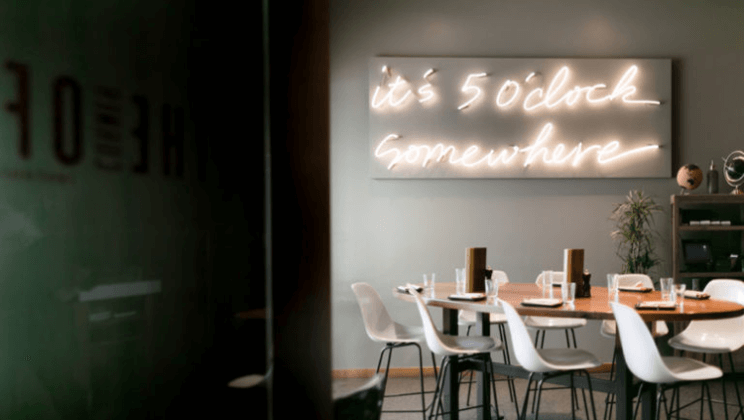 Plus, the Source Hotel offers 2,300 square feet of dedicated on-site event space, including a 250-square-foot room on the rooftop perfect for private dinners or a conference room. The event space is situated just off the market hall and features large roll-up garage doors, polished concrete floors, and 23-foot ceilings. With cocktail bars and eateries just steps away, this location creates a lively environment for guests to mingle and explore the many offerings at the Source. Bacon Social House is nestled in the beautiful Sunnyside neighborhood in the heart of the redeveloped Cobbler’s Corner. As you can probably guess, Bacon Social House has lots of bacon on both their brunch and dinner menus. 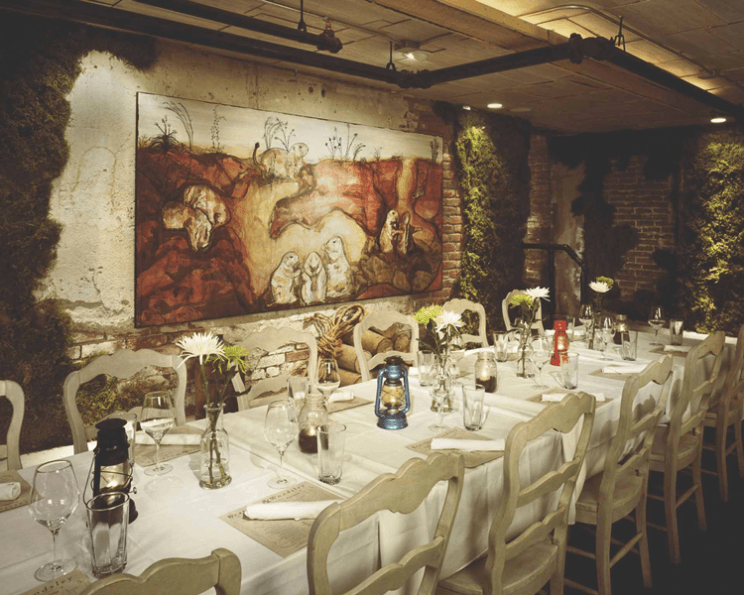 They also have capabilities to host a private event, either in their main dining room, out on the patio when it’s open, or in the mezzanine upstairs any time of the day or night. The team at Bacon Social House can create a diversified food and beverage menu for your group and can accommodate parties from 20 to 150 people. 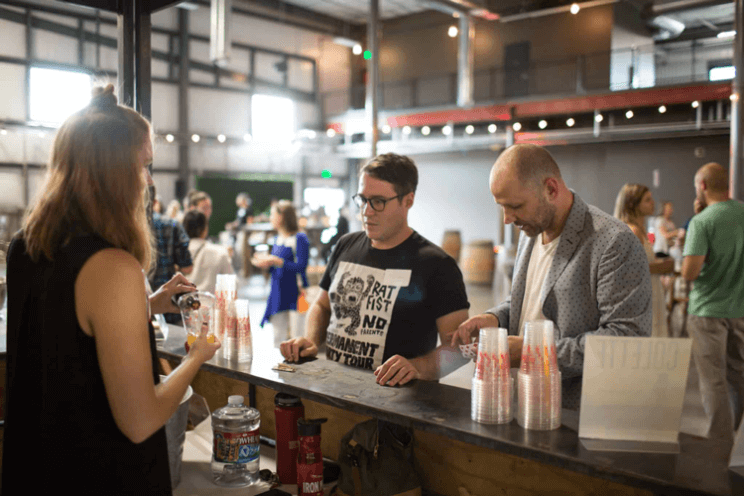 We can’t think of many things more “Denver” than hosting a party at a local brewery. The Great Divide Barrel Bar and Packaging Facility in RiNo offers beautiful mountain and city views and a unique private event space. Plus, this venue offers a behind-the-scenes perspective of the Great Divide facility and brewing operations. It’s the ideal space to host a corporate gathering, social event, networking happy hour, or any other special occasion. Choose from the three spaces available for rent, including the bottling hall, the mezzanine, and the barrel bar. For a particularly unique experience, consider hosting a laid-back party at Grandma’s House — a quirky brewery nestled in the Antique Row stretch of South Broadway. The relaxed and nostalgic setting of the brewery makes guests feel as though they are right at home — or at Grandma’s house, more accurately. The brewery offers up the entire 2,000-square-foot room with 30 foot ceilings for private events, including meetings, birthday parties, trivia night, family rooms, or even a wedding. Take your party to new heights atop The 360 at Skyline, an exclusive rooftop patio overlooking the downtown skyline and Front Range in the distance. In fact, as the name implies, you can enjoy uninterrupted 360-degree views of surrounding scenery at this sleek and modern event space. The rooftop patio is available for rental for a maximum of 175 people. Plus, the Denver Skyline building has fully furnished penthouse apartments just a few floors below to accommodate traveling guests. This classy venue perfectly captures the lively energy of LoDo and Union Station. Situated just steps from the train station, Citizen Rail is focused on dry aging and smoked meats, utilizing wood-fired cooking to perfection. Their hearty menu is complemented by an exceptional bar program with spirit-forward cocktails, Colorado craft beers, and a thoughtful list of wines. Citizen Rail’s semi-private dining space can accommodate up to 12 guests and a full restaurant buyout can treat up to 125 guests. Contact their events specialist or fill out a private dining inquiry to begin planning your special event! Centrally located in the heart of downtown just steps from the Denver Convention Center, The Corner Office is an exceptional place to host a party. This sleek and modern eatery puts a twist on comfort classics all across the globe. The options are limitless, as the private event rooms at TCO can accommodate between 10 and 300 people. Plus, they serve breakfast, lunch, dinner, and even late-night snacks — and of course a variety of drink options. All dining guests enjoy free parking in the garage to eliminate the stress of finding nearby parking in this busy area. Historic meets modern at Hotel Teatro, a modern and upscale hotel housed in a gorgeous red-brick building built in 1911. This boutique hotel hosts a unique and charming gathering space for your next event, whether it’s a reception, rehearsal dinner, a holiday party, or any other special occasion. Enjoy delectable food and drinks from the hotel’s onsite restaurant, The Nickel, named one of the best spots in downtown Denver. Looking for more party inspiration? Check out our list of the best adult group party ideas in Denver!